It is thought that Cotons arrived in Madagascar, located off the southeast coast of Africa in the Indian Ocean, several hundred years ago by ship either by being carried as ratters, companions to ladies, or by being sole survivors of a shipwreck. No one really knows how they got there, but they soon established themselves as pets in many households, as well as the royal court. A few short years ago in the 1970s a Frenchman visiting the island fell in love with the Cotons and worked to establish them as a breed. Cotons made their way to America in that same decade. Their ancestry is closely related to the Bichon Frise and the Maltese. 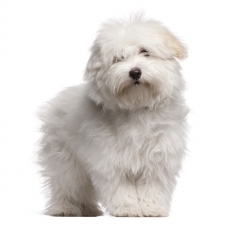 The name Coton de Tulear comes from their cotton-like coat and from the seaport city of Tulear (now known as Toliara), located in Madagascar. Cotons are very sociable and sweet-natured little dogs. They get along well with everyone, including children as well as other dogs and animals. They are very friendly, gentle, and become very attached to their home and master, always wanting to be with them. They are pleasers and love nothing more than making you happy. Cotons are intelligent and learn quite quickly. In fact some of them can jump up and walk on their hind legs, which can be quite amusing. They were never bred to be anything but a companion, and that’s what they do best. Cotons love to go on walks, but their exercise needs are not excessive. They make good watchdogs by barking when someone comes to the door; however, the only risk a burglar faces is being licked to death. Cotons usually weigh between 8 to 13 pounds and stand approximately 8 to 10 inches tall. They are a small dog and are known for their beautiful coat that is soft and thick with a fluffy, cottony texture. They require weekly grooming but shed very little. The Coton is the “Official Dog of Madagascar,” and a tricolor Coton was honored on a postage stamp in 1974.